A golf glove helps a golfer grip the club while protecting against blisters. The golf glove is a key piece of equipment in your golf game. The golfer creates the swing, the clubs help to execute a shot and a golf glove allows you to grip the club and protect your hands. By buying a quality golf glove, you may help solidify your golf game. Golf gloves offer protection from the weather elements and keep your hands healthy. 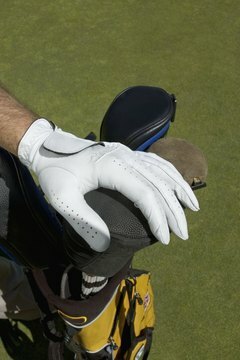 The golf glove prevents blisters on your hands from rubbing the club grip on the skin. Normally, if you are right-handed, you'll wear a glove on the left hand. But you can wear gloves on both hands for added protection. The glove also creates grip to prevent the club from slipping out of your hands. Golf gloves also might help you to relax by not overcompensating the grip. The traction of the golf glove allows you to loosen your grip. Gloves have holes to allow for perspiration to evaporate into the air, keeping the hand and glove dry and your grip on the club firm. The glove should fit comfortably over your hand and serve as a second skin. The glove should stretch across your palm, and the fingers shouldn't be too short or too long. Gloves over a Velcro strap secured across the hand for good fit. Golf companies make gloves based on fit. They range from small to XXL sizes and are made in cadet, men's and women's sizes and styles. How Do I Fit a Golf Glove? What Causes a Hole in a Golf Glove? What Size Golf Grips Do I Need?